Nic Fallowfield and his colleagues in the Tedesca Quartet have brought an innovative teaching approach to our famous Group Quartets courses, and previous participants have enthusiastically attested to the enjoyment and benefits gained from that. 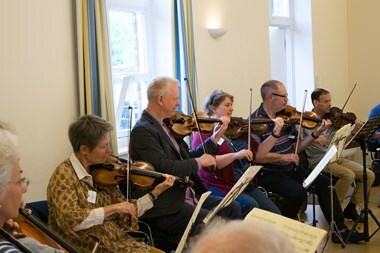 Course members play in a large-scale quartet formation with the tutors coaching from within the group, encouraging maximum participation in discussions of musical and technical matters and thus enabling everyone to be actively involved in determining how the set works are played. This time we will be working on Dvorák's Cypresses (Nos 2, 5 and 12) and Beethoven's String Quartet in E minor Op 59 No 2, which will be played by the Tedesca in a public concert on the Wednesday evening, which is included in the course fee.